If you have visited Seoul before, it is very likely that you have already gone to Insadong (인사동) since it is a popular tourist spot well-known for traditional Korean arts & crafts, workshops, galleries, restaurants and tea houses, some of them are housed in remodeled hanoks (i.e., the traditional Korean-style houses). When I studied Korean in Seoul, Insadong was one of my favourite places for spending my weekends in a relaxing way – I liked to read books while having the traditional Korean tea in one of the tea houses there. Let me share some interesting things about Insadong in this post. Insadong had been a place for government departments and residences of government officials during the Joseon Dynasty (1392-1897). The first two characters in its name, “In” (인) and “Sa”(사), were derived from the names of two government departments of Hanseong (the old name of Seoul) city government, Gwan-in-bang (관인방) and Dae-sa-dong (대사동). The third character, “Dong”(동), means neighbourhood area. Insadong was also the birthplace for the independence movement against the Japanese colonial rule on 1 March 1919. Ssamziegil is a complex cultural space in Insadong and houses a wide variety of shops selling arts & crafts in both traditional Korean style and the modern style. You can also find various exhibitions and performances there. One of the snack food sold there which I like very much is the “poop bread” (동빵 – Ddong-bbang) which is a thin waffle-like poop-shaped bread with red bean paste and walnuts inside. It is freshly made and tasty, and costs only 1,000 won per piece. There is also another version with chocolate fillings but I like the red bean paste fillings more. 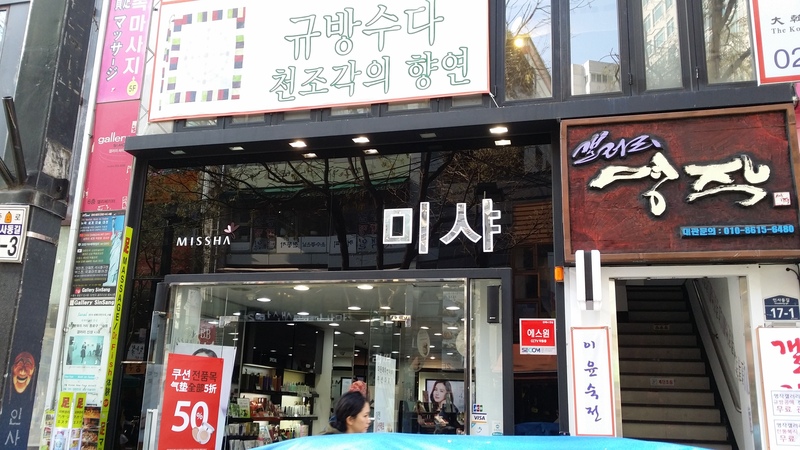 As Insadong is a symbol of traditional Korean culture, the shops located in Insadong are required to display their shop names in Korean. 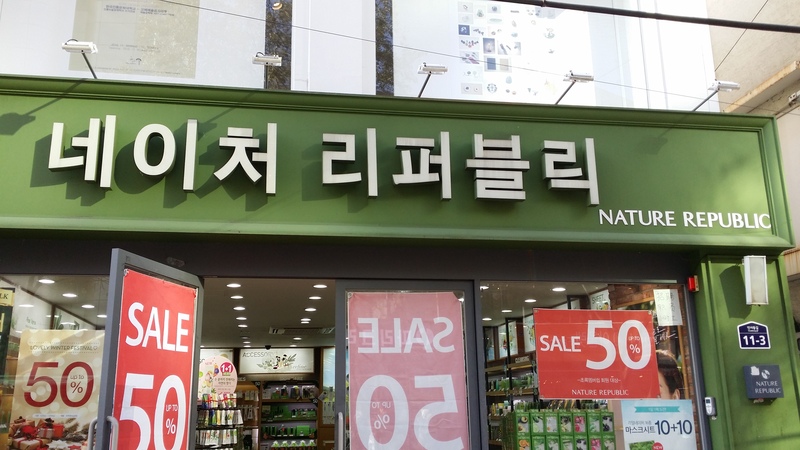 So, even for shops which usually display their English names only, they should display the Korean transliteration of their names in the shop signs in Insadong. This practice is unique to Insadong in South Korea. 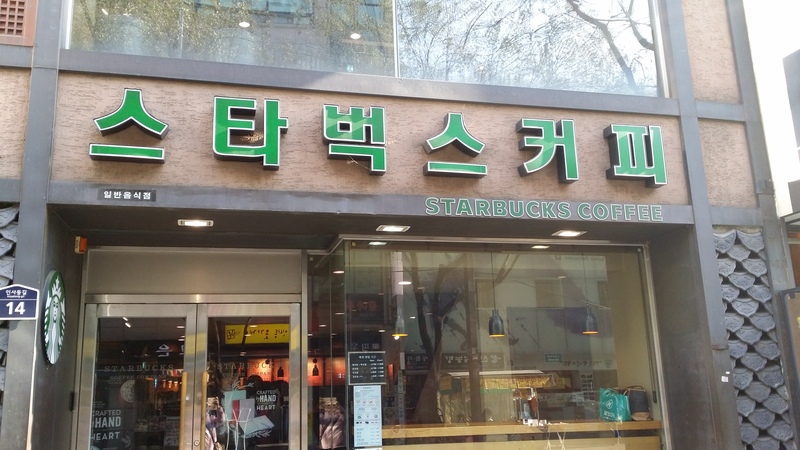 You can have a look at the photos of the shops signs taken by me for the Korean names of Starbucks Coffee, Missha and Nature Republic in Insadong – you can only see the English names in the shop signs for these shops in other places. Insadong is conveniently located – within 5 minutes’ walk from Exit 6 of the Anguk subway station. It is a good place to spend a relaxing day and get a feel of Korean traditional culture.